SCORE provides start-up businesses with free, confidential mentoring, low cost seminars and helpful business templates to get you started. 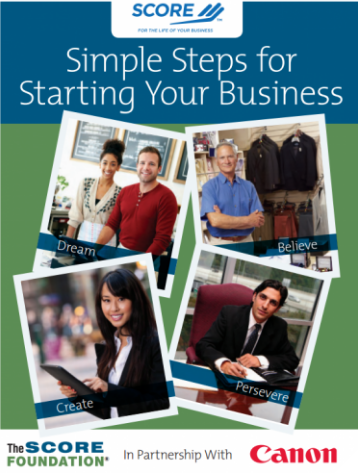 Stop by any one of our branch locations and pick up a FREE copy of SCORE’s Simple Steps for Starting Your Own Business. This 60 page booklet will help you develop a plan that will make your business a success. If you’re serious about starting a business, take advantage of the expertise of SCORE’s professional business counselors. SCORE counselors provide guidance from the idea stage thru preparing a business plan, obtaining financing and the grand opening of your new business. Click here to set up an appointment and be on your way to starting your own successful business. Several organizations provide useful templates to guide you through preparation of your business plan. Internet training course on how to start a business, how to write a business plan, etc. A sole proprietor needs to register your business name. You can obtain a business certificate for a nominal fee at your city/town clerk’s office. However, for many types of businesses you may need special licenses or permits to operate. Your city/town clerk should be able to provide information on licensing in your area. You should also get information from the state of Massachusetts on line. You can obtain a Massachusetts Sales Tax Resale Certificate on line. This allows you to purchase items for resale without paying sales tax. You will need an employer ID number if you have employees. Vendors frequently ask for your EIN number to identify your business. You can apply on line at no cost. Your business may be exposed to a wide variety of losses. To protect your assets read this informative article.